A similar bill, SB 810 by Assemblyman Leno, has been introduced in the Legislature, but stands little chance of becoming law unless a candidate who supports healthcare for all is elected next fall. Schwarzenegger also vetoed six bills that would have required prohibited insurance companies from cancelling coverage when people get sick. Not only is the cost of insurance premiums rising, but the quality of coverage is shrinking. “People don’t understand that your coverage is actually dropping,” she said, noting that insurers bury such info in voluminous notices to policy holders. Meanwhile, more than 25% of the money you pay for premiums is spent on overhead, Kuehl said. Single-payer health insurance collects all medical fees and then pays for all services through a single government (or government-related) source. Single-payer goes beyond the Obama administration’s healthcare reform proposal, which would give consumers a choice between keeping their existing private insurance or signing up for a public option. Medicare and healthcare provided through the Veterans Administration are two examples of single-payer systems. Many European nations also have single-payer healthcare. Virtually all developed nations in the world provide some form of healthcare for all citizens, except for the U.S. Not all have single-payer systems, however. In some, private insurance companies are part of the mix—but abuses that occur in America are outlawed. “In Switzerland and France, you can choose private insurance if you want,” Kuehl noted, citing two examples. “But it is very, very highly regulated. Insurance companies must be not-for-profits.” In addition, private insurers must cover everything covered under the public plan, at minimum, and must also provide service at least as quickly as under the public option. France is ranked number one worldwide in terms of healthcare outcomes, according to the World Health Organization. 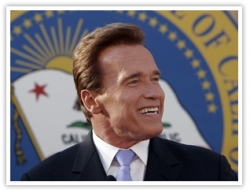 The bills were backed by numerous organizations including California Nurses Association (which drew attention to Schwarzenegger’s opposition with stunts such as flying a plane towing a banner over an outdoor event hosted by the Governor) . The Governor responded vindictively, recalls Kuehl, who has authored 171 bills that were signed into law in her 12-year legislative career. “Last year, he was mad at me and vetoed all 22 of my bills in one day,” she said. Kuehl had to remove funding from the bill and instead add language to set up a blue ribbon commission to determine the best means of paying for single-payer, even though she estimates it would save the state money. “The bill has to have no money in it, because it never gets a Republican vote,” she said. In California, any money requiring spending must pass the Legislature by a 2/3 margin – an impossibility without at least a few Republican votes. “In the Republican party, they truly believe that government is not the answer,” she explained, quoting GOP strategist Grover Norquist’s famous call to shrink government to where you can drown it in a bathtub. “Frankly, I think that’s what Arnold is doing,” she said. “He cut $500 million in the last round of budget cuts,” she added, noting that the cuts hurt poor people and have closed shelters for victims of domestic violence. Republicans, however, have voted as a block to oppose every bill that would increase state revenues, even modest increases in taxes on yacht sales and cigarettes. Republican candidates for Governor have voiced opposition to universal healthcare proposals, including single payer. East County Magazine recently asked two potential Democratic contenders for Governor, Gavin Newsom and Jerry Brown, if they would sign healthcare for all Californians bills that Schwarzenegger ha vetoed which would have guaranteed universal healthcare to every man, woman and child in California including medical, dental, mental health and eyecare coverage. “I’m the only mayor of a city with universal healthcare,” said San Francisco Mayor Gavin Newsom, who chairs a task force on healthcare reform for the National Conference of Mayors. 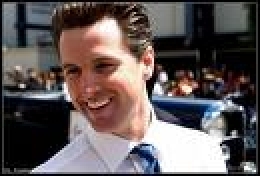 “Unequivocably, yes, I would sign it.” We spoke with Newsom during a Stand Down for Veterans event in San Diego. On Saturday, we posed the same question to former Governor and current Attorney General Jerry Brown at the San Diego Grassroots Democratic Convention. “We just can’t afford it,” said Brown, who added that he believes Obama will succeed in providing universal (though not single-payer) healthcare for Americans. Republicans have called instead for other steps to reduce healthcare costs. In an interview recently with East County Magazine, Republican gubernatorial candidate Meg Whitman suggested the need for squeezing fraud out of the healethcare system. But Kuehl said while fraud exists, she does not believe there is a lot of fraud and that the cost to track it down could be more than what would be saved on fraudulent claims. Moreover Republican plans fail to provide numerous protections that she believes consumers need to protect them from insurance industry abuses and gaps in coverage. “What’s so great about single payer? You don’t lose your insurance if you lose your job. You don’t lose your insurance if you have a pre-existing condition,” she said. 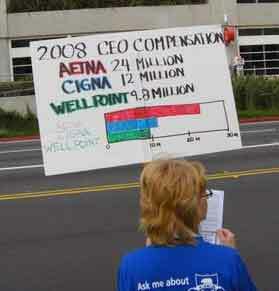 Her bills also included holistic care, such as chiropractic and acupuncture. “Single payer achieves all goals,” she argued, noting that cost savings would be achieved through a centralized database and by rewarding hospitals for good behavior – i.e. better healthcare outcomes. If passed, single payer would all-but eliminate private insurance companies, which would only be allowed to offer coverage for services not included in the state single payer plan, “and that’s not very much,” the former Senator said. She urged advocates of single-payer to continue lobbying legislators at the state and national level. “Single payer advocacy is what’s keeping the public option on the table,” she said, adding that many in Congress view a public option as a compromise. A better choice, she believes, is to eliminate private insurers almost entirely by enacting single-payer healthcare for Californians—and at minimum, a public option nationally. She cites a national poll which showed 70% of registered Democrats prefer a public option—and 30% want single-payer. Various national polls have shown a healthy majority of all voters now support a public option. She views the shift in public opinion as progress. Kuehl dispelled a myth, noting that the President’s plan would NOT provide free coverage to illegal immigrants. “Undocumented people will have to pay for care, except for emergency care, which they already get now,” she said. Kuehl predicts that SB 810 will pass the Senate by January and be voted upon in the Assembly by next August, after which it will go to the Governor’s desk—again. The measure stands little chance of being signed by Governor Schwarzenegger, but proponents pledge to keep trying. She admits the struggle to attain healthcare for all Californians has been grueling. Since leaving the Legislature, Kuehl now serves on the California Integrated Waste Management Group. But she admits to one benefit from her change in roles. If you missed Kuehl’s presentation but want to learn more about healthcare reform options, the League of Women Voters plans an October 20th lunch program titled “Health Care Reform: Can We Pass the Final Hurdle?” Keynote speaker Gerald Kimonski, Ph.D. , Associate director of UCLA Center for Healthy Policy Research, will join Jeoffry Gorden, M.D. of the California Physicians Alliance who will summarize the political climate in Congress. The program will be held from 11:30 a.m. to 1:30 p.m. at the Hilton Hotel, 1960 Harbor Island Drive in San Diego. Cost is $25 for LWV members, $30 for nonmembers. 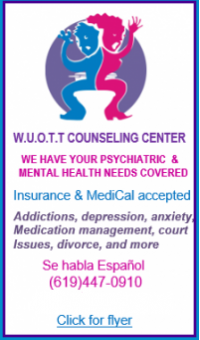 Co-sponsors include California Physicians Alliance, Center on Policy Initiatives, California School Employees Association, First Unitarian Universalist Church of SD, and the Older Women’s League. 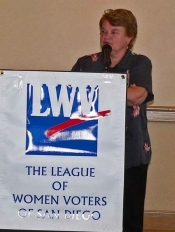 To reserve space, mail a check to LWVSD, 4901 Morena Blvd., #104, San Diego 92117. 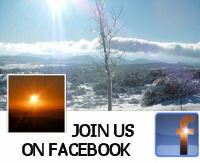 Call (858)483-8696 with questions. Reservations should be received by Oct. 13 for the Oct. 20 event. Get details on SB 810. For information on joining the coalition, visit healthcare for all Californians.